Malin’s high quality soft stainless steel, soft monel and copper wire are available in our patent pending dispenser can and our handy pocket pack dispenser. The dispenser can contains 800 feet of wire, while the pocket pack dispenser holds 200 feet of wire. 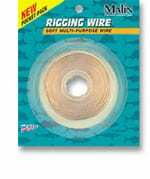 Our Rigging Wire is a great value and is ideal for rigging Malin Soft Wire baits since it is not pre-cut. You use what you need.